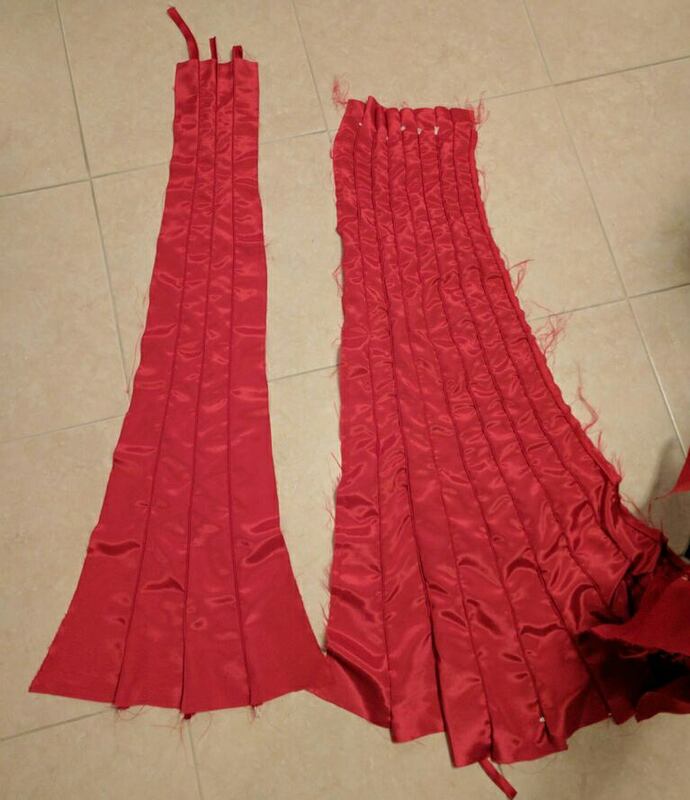 Now, I have come across a problem: I've started sewing the panels together for the main dress, and for some reason my panels are not lining up. I have tried lowering my tension, elongating the stitch, changing my needle... I use Gutermann thread and my machine seems to favor that, so I don't think it's the thread either (I even used different spools of the same thread, and still nothing. 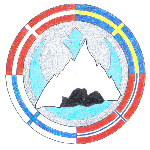 ), using a walking foot. But my panels aren't lining up, are curving after I sew the piping on, and are puckering like crazy! My mother thinks it's the fabric I'm using - I'm using a Bengaline fabric I bought online, and it doesn't stretch. I'm not quite sure what the problem is at this point. Please, send advice! 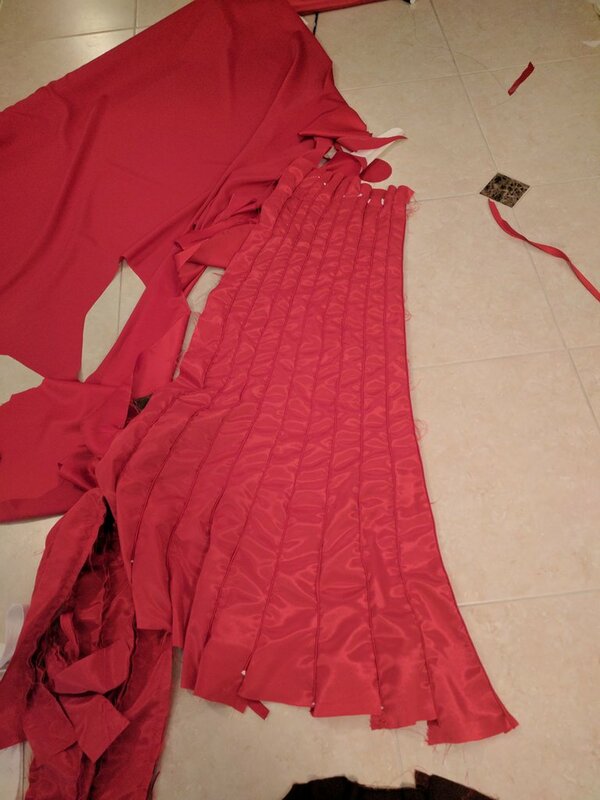 I'd like to finish this gown and figure out my problem with those tricky panels. Thank you so much! 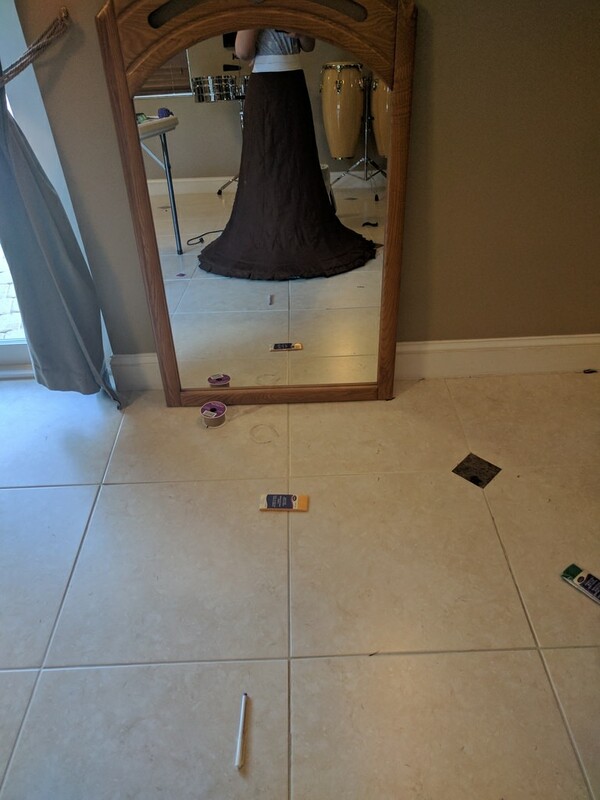 I'm going to start off with my underskirt - which is FINE. The panels came out perfect, and everything sewed fine and aligned fine. I used the same pattern for the actual dress, which I copied and measured and elongated at the top so it would reach to my chest (I was planning on sewing it into a yoke as it would be easier in the end). I then cut out my panels. As you can see, after I start sewing in the piping, the panel starts to curve. The pattern in the brown paper to the right of it shows what it should look like. After sewing in a few panels, it starts to look like this.... notice the puckering and the misalignment. Then, things started getting crazy. 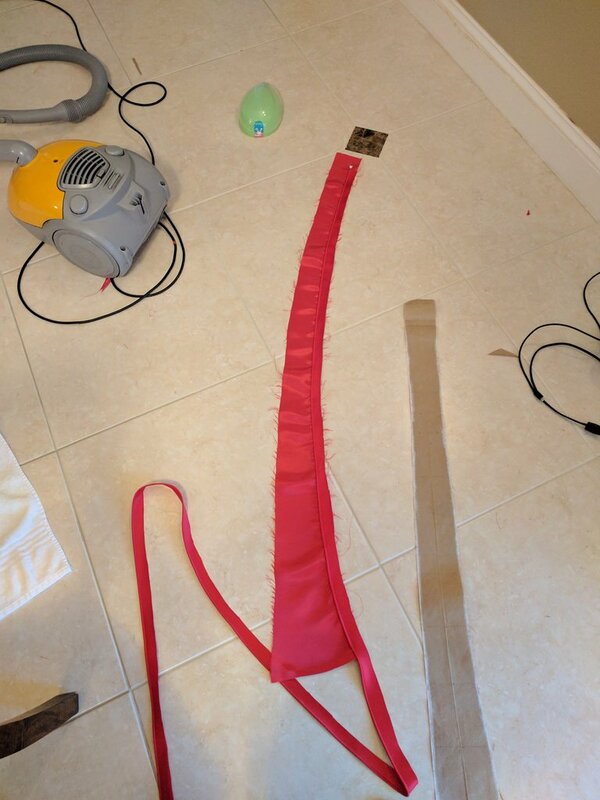 I seamripped and attempted putting the panels together and sewing them from bottom - up instead of up-bottom but nothing worked. It was REALLY bad at first, and the panels would "cascade" at the bottom in an upwards direction. Please note- I haven't overlocked the edges because I was testing to see how everything would work. Additionally, as I briefly mentioned above, I'm not sure if it's the fabric itself. 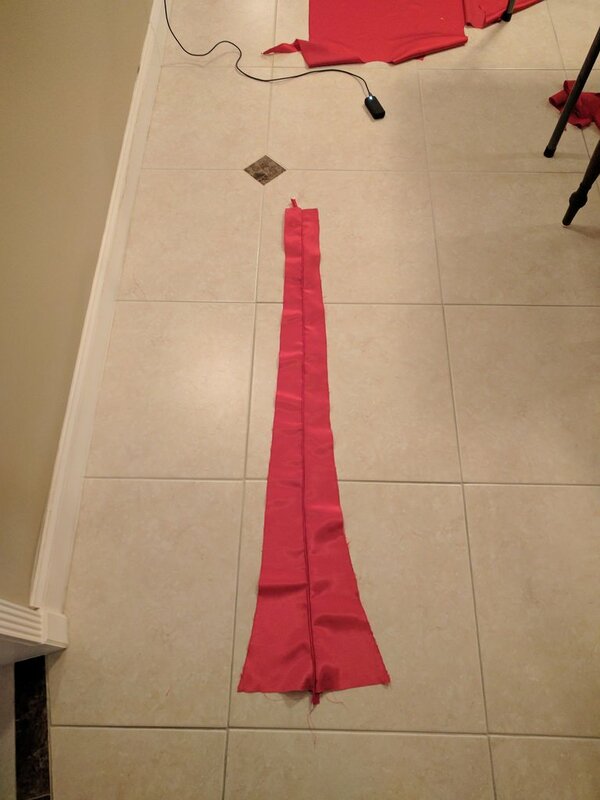 I ordered the Red Valentine Bengaline from onlinefabricstore.net, and it seems a bit shinier than other Bengaline I've seen. 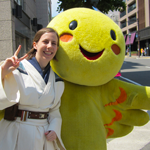 I was at Star Wars Celebration Orlando and my friend lent me her gown, and the material wasn't the same, but it was Bengaline (it was ribbed in the same exact manner). Your shape looks great! Make sure to give everything a good ironing so it lays flat when you're done. It seems like the sheen isn't too much, so I'm not too worried about your material. Are you sure that the grainline is the same on all pieces, and the piping? The grainline affects the stretchyness of the fabric, and if it's different on pieces that go togeter it might make them shift in relation to each other. Yes! The fabric was pretty wide so I folded it selvedge to selvedge and cut two pieces at a time along the grain line. And the piping I made from scratch, I used a cotton cording that I purchased from Joann's and cut bias tape from the satin fabric and used that for the piping. I'm not sure if the piping is actually the problem, since the satin WAS cut along the bias. Although, I read in naergilien's tutorial that it was supposed to be bias tape. I'm not sure if there is another method to do this - I might have to end up hand sewing each of the panels if worse comes to worse... I sure hope not though!! Thank you! I am actually really proud about my underskirt because I wasn't sure how it would turn out, and this is my first time drafting my own patterns. I had made channels for hoops in 7 different "layers", but I ended up only using the bottom two channels because I was satisfied with the way it looked. And also, when I iron, should I iron the panels or the back of the piping? If I do iron the piping, do I iron to one side or open the flaps so I iron it evenly? And should I iron after I connect each of the panels together, or after they're all connected? I've tried ironing the actual panels, once they've been set in-between piping, but that doesn't seem to get rid of the puckering at all. I also think it might be the way my sewing machine is stitching it. For some reason, with tension on zero, the stitches are coming out normal, yet snug. Like I said above, I've tried everything I can in regards to the sewing machine mechanics. Just trying to throw all my theories on what the problem is. What I can think of is that is might be the piping affecting things, because the underskirt looks excellent. Maybe try ironing everything? Perhaps a stabilizer could be used as well. It is possible your sewing machine doesn't like your fabric. The last thing I can think of right now is to take the machine apart and clean it. For ironing, you're in a bit of a sticky situation now with it all together. My old boss in the costume shop drilled into us: "sew it, press it flat, press it open." You will first want to press the two pieces together as you sewed them. This secures your stitching in place and marries the seam together. Then open it up and press the two halves of the seam open. You may want to skirt around your piping when you do that if you find the ironing flattens it. As for the bias tape: Yes, the tape is, of course, supposed to be bias tape. Otherwise, it wouldn't curve well. Do the panels line up as pattern pieces? 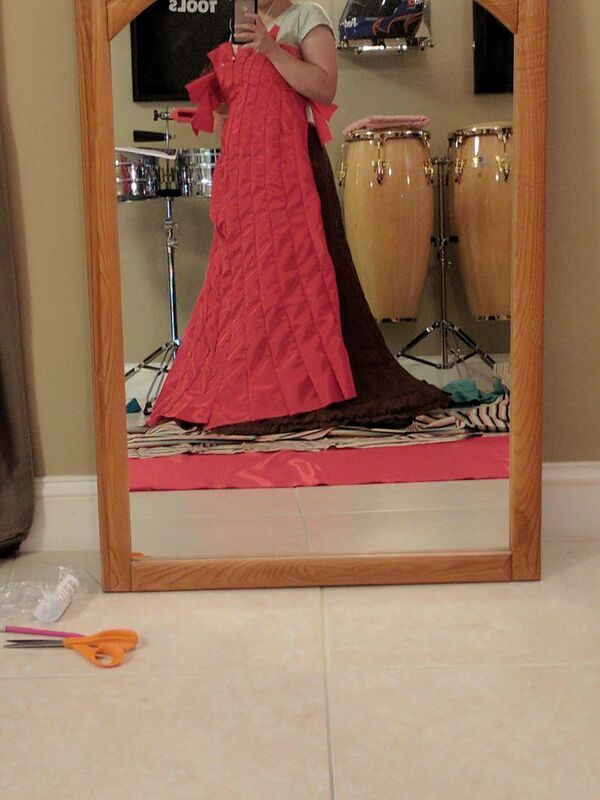 Do they have the correct length; are you connecting the correct panels (as there are 12 different lengths of panels in the dress, which are also mirrored, which leaves you with 24 completely different panels)? I remember when sewing the gowns I made, I had to be VERY careful to connect the correct panels... and I think once or twice, I still ended up sewing the wrong panels together, even if I numbered them as soon as I even just transferred the pattern from paper to fabric. Also, I always started sewing the panels together at the hem. Because that, I knew, was a "straight line" in my pattern, while the "top" of the panels, at least in my pattern, wasn't straight (it's going over the bust and under the arms, after all). How did your mockup turn out? Did the panels align correctly on the mockup? The grainline on my panels always matched that hemline. I *think* I now know what one of the problems is. You said that the panel started to curve after sewing in the piping. You also noticed the puckering along the piped seams. Is it possible that you used a flexible cording inside the piping? 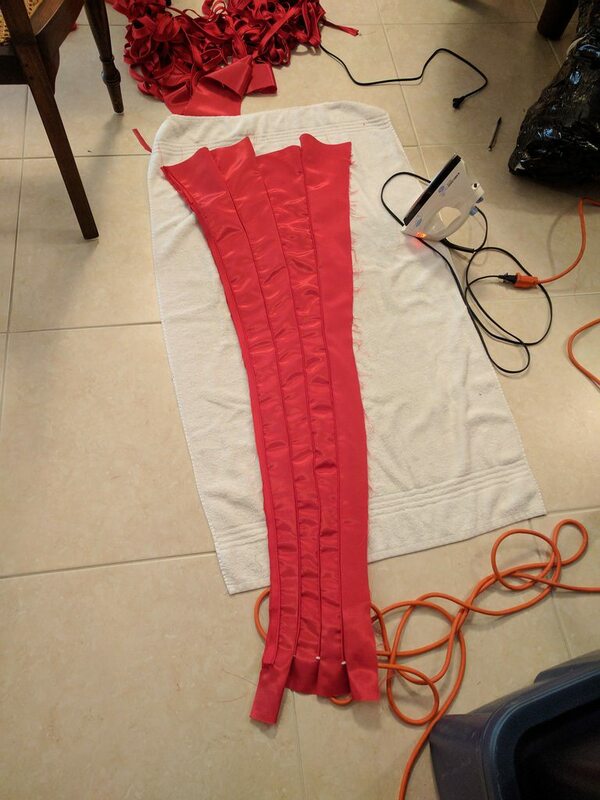 Or maybe that you even just stretched the piping just a little bit while sewing it into the seams (which is very well possible because it's bias tape)? That would result in puckering seams. It still doesn't explain why the panels don't line up; but as I already said, that could be a problem of the "curved" top. PHEW. Now that finals are over, I can get back to this! Alright, so I had actually planned on sewing a yoke rather than all the way to the top to make the full dress. 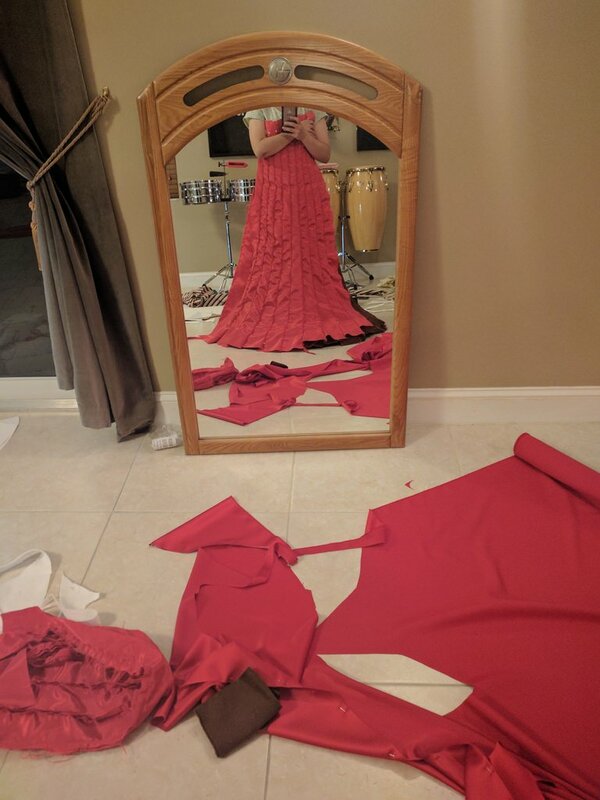 I had planned on making all the pieces just over my bust, and then pinning it to my dress form and physically modifying the tops of the panels that way instead of making a bunch of different pattern pieces. As for your second response - I had actually never thought it would be the material of the cording itself. As I was sewing, I noticed the panels were puckering like crazy. I tried lots of technical changes and nothing worked. 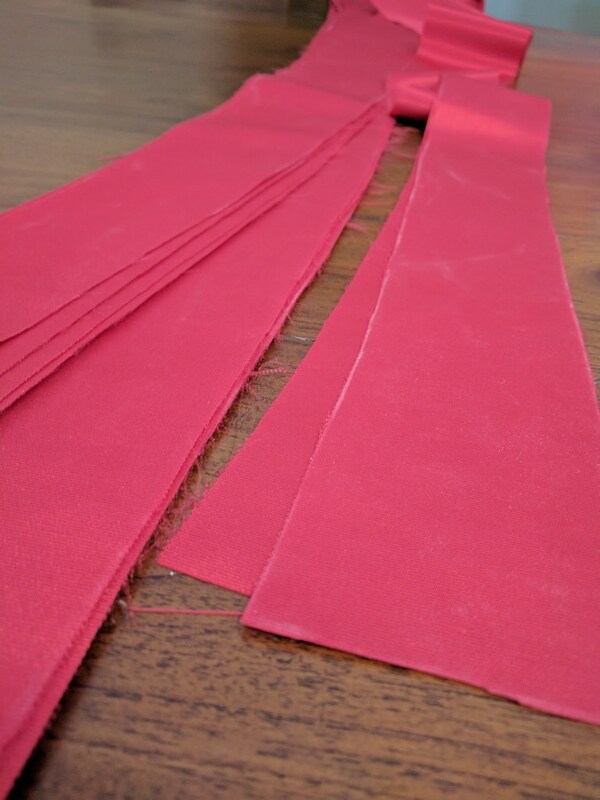 I even tried a walking foot, which was actually helpful in that my piping would sew more accurately in where in needed to sew, but there was still puckering going on. 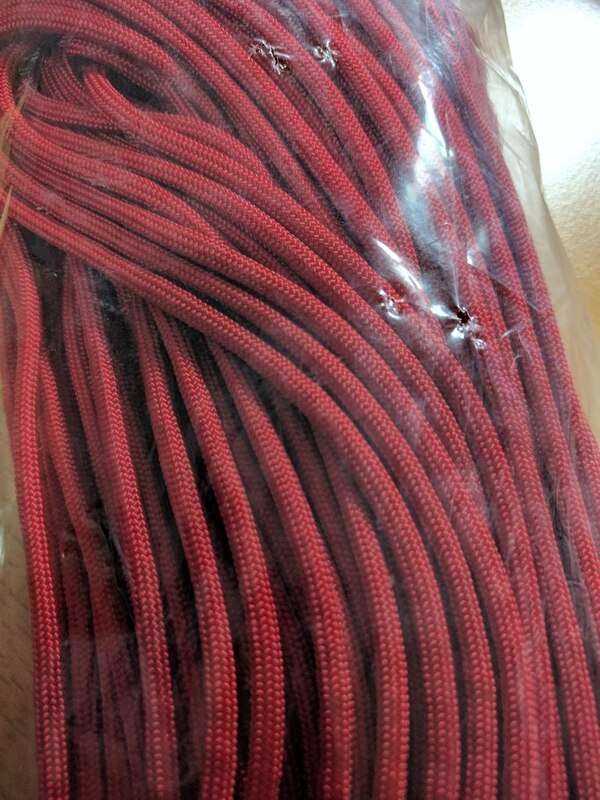 As for the material of the cording, I was originally going to use paracord. 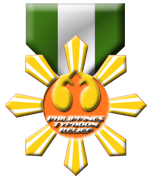 I scrapped this idea because I was afraid it would melt when I tried ironing it. Then, I was deciding on piping cord. 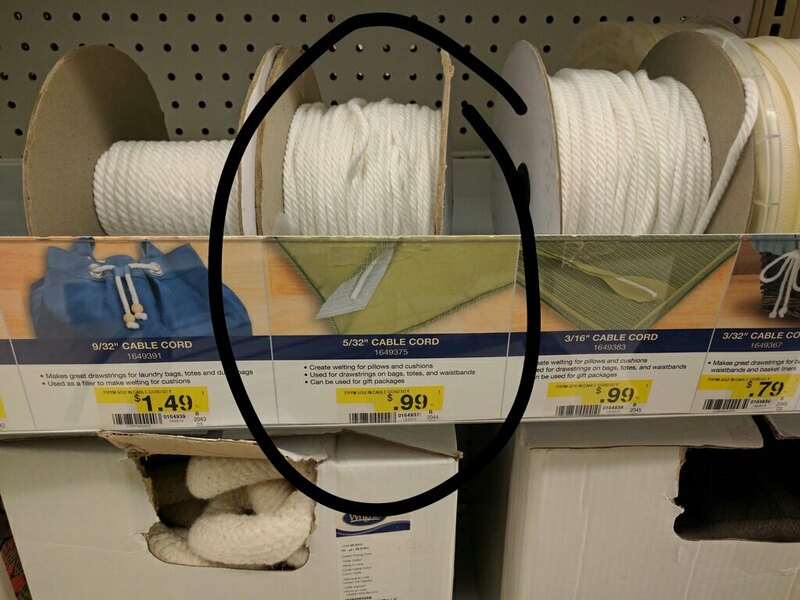 I went to Joann Fabrics, where they have a selection of cording in yardage rolls. This is where it got tricky - I seem to realize that you have pointed out what might be the problem, as when I was purchasing the cording, there was a variety of options, but I chose by size rather than material. 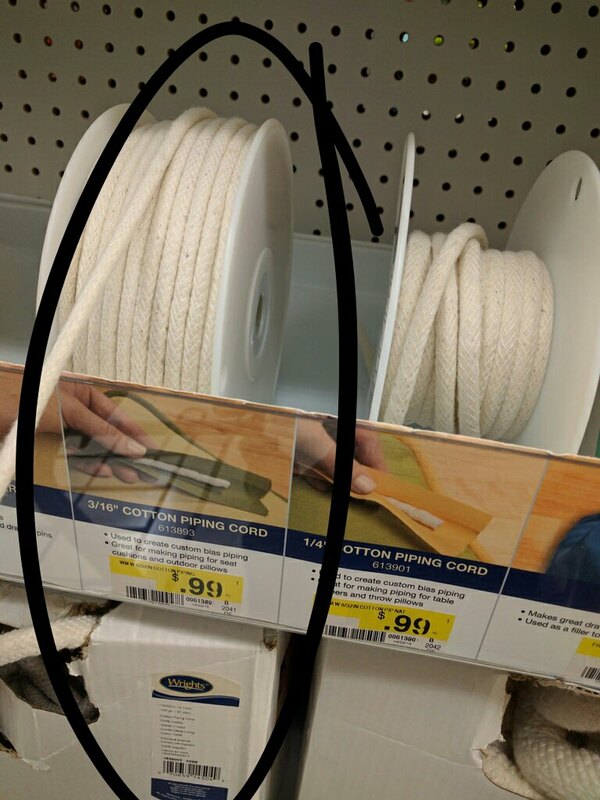 I was looking at my photos, where I took some pictures of the materials at one trip I took to the store and I realized that there were differences in the items themselves. 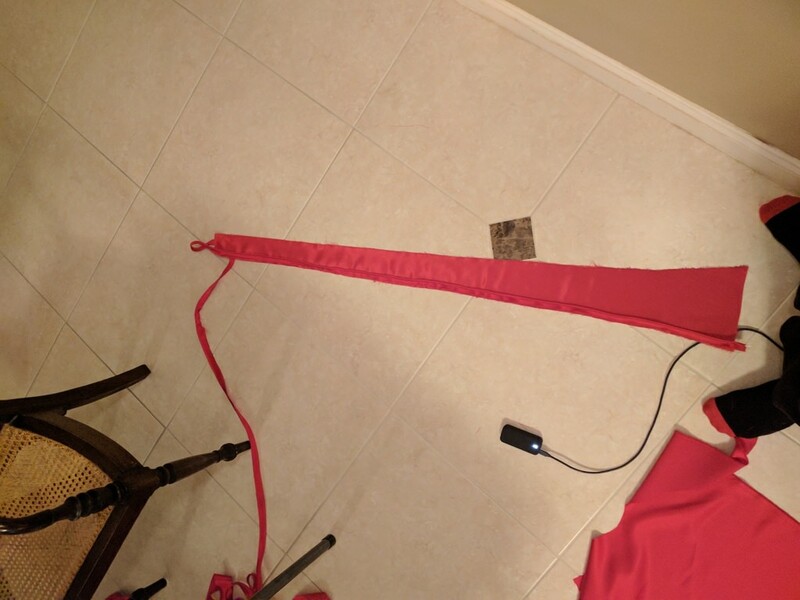 When I was using the scaling method to find dimensions and measurements of the costume (I'm the same height as Natalie Portman), it seemed to me that a 5/32" size was more accurate than the 3/16" cording. So, I bought just that size - which was called "Cording" rather than "Piping". 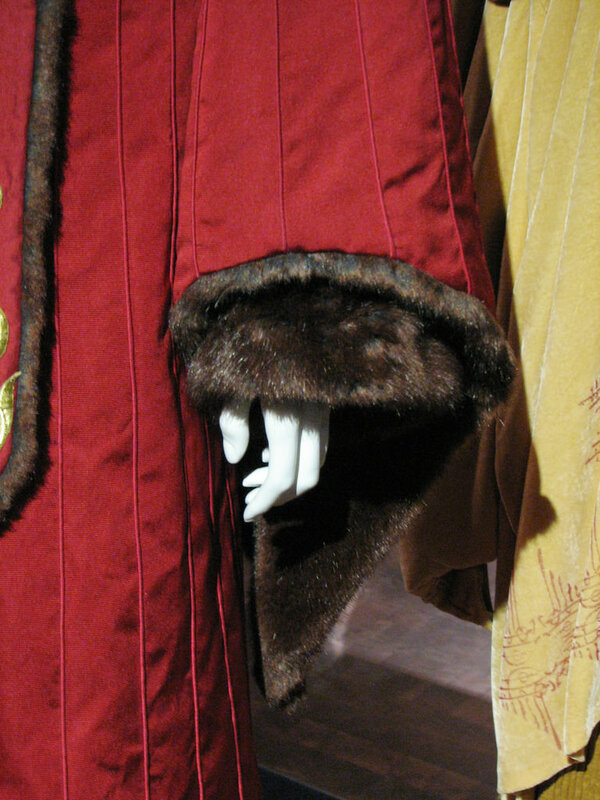 This is a reference photo I found online from the expo with the original gown. It seems to me, that the piping is 5/32" rather than 3/16" (too thick). Note: this is the 3/16" piping cord. This was my first choice, but it wasn't the right thickness for me. And this is the 5/32" cable cord that I ended up purchased. Notice that the descriptions for the items are different, and even the material is visibly different. I didn't think that this may end up in my panels curving initially, but now that you pointed it out, this may be the problem. This was another option I had found at Hobby Lobby, and I had come across it at one point but this was just a back-up option. It seems to me (if it is the right measurement) that I might go back and purchase this. I know that you had mentioned something about using a natural cord (hemp cord, I believe), but I think I ended up using the cording from the sewing section because it made more sense to me at the time (it is a fabric store, after all). I've never sewn with cording, but now I know a little bit more! 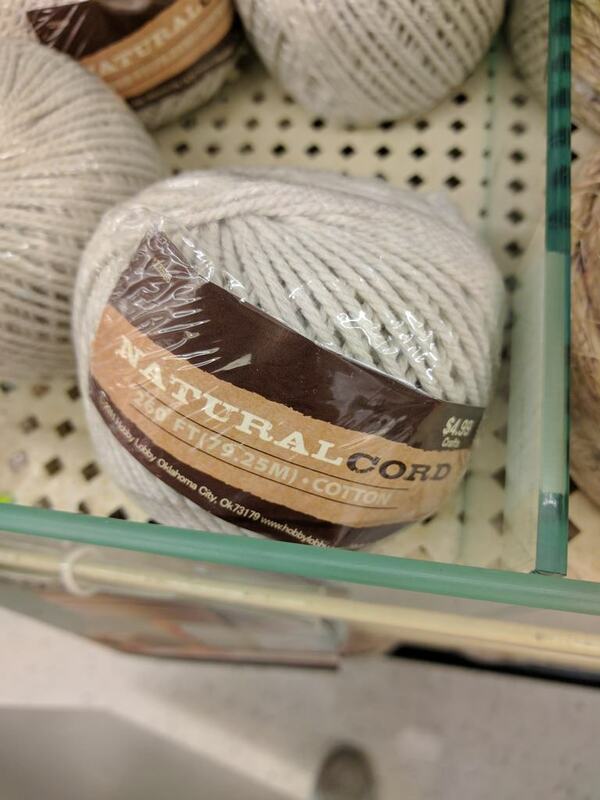 There are several problems with natural, aka cotton, linen or hemp cording. The worst is that it will shrink when you iron over it or wash it. Seriously, it will shrink (up to 10% in length). Another problem: "drilled" cording (that's your "cable cord" as well as the hemp cording) tends to shrink more than "woven cording" (that's the "piping cord"). Solution for both: Get woven polyester cording. That cording won't shrink. Seriously, that's also what I used in the Red Invasion gowns I made. You'd have to iron it REALLY hot and REALLY long in one place to make it melt. This is actually the second time I sew... period. In all honesty, if it weren't for your breakdown, I wouldn't have had any courage to do this dress, so thank you so much! I spent so much time reading and re-reading your tutorial so I could understand the concepts and further my research on specifics. After all, I am really new to all of this! As for the cording... I see what you're saying. 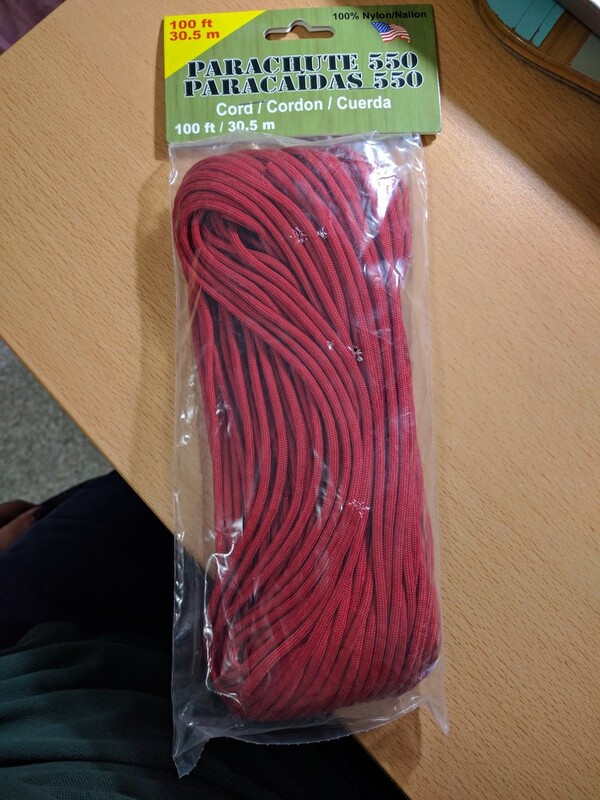 I did buy the paracord I mentioned above, and was going to return it, although I still have it. I think the woven polyester cording is the paracord, just in different terms. I was looking at your pictures in your tutorial and I thought that that's what it was, but after purchasing I decided against it because I figured it would melt if I ironed it. I should've done more research, because apparently paracord melts at about 244 degrees Fahrenheit, while a normal clothing iron runs from 180-220 degrees. So, in actuality, it shouldn't melt. This is good news! It seems like I'll have to give this a try, if this is what you were talking about. And, this is what I have - I bought 3 packs of this. It's 4 mm wide, so I think I'll need to return these anyway and get a thinner size. It definitely won't melt. 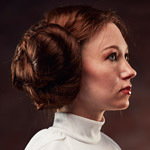 I used that for my Snow Padme pompom tassels, and tried to seal them after cutting them by melting the ends with fire. I didn't work (although eventually they did catch fire). I had to dip them in wax instead. Great work so far, looking forward to more updates! Greetings! So, it's been a while since I've posted- finals were coming up, and we were leaving for a vacation that we just came back from yesterday. So today, I got back to sewing. I had started using the paracord instead of the parachute cord... And I think it's working. I made new bias tape with it and got to work immediately. Also, I am still in the middle of carefully seam ripping my previous panels that I had seen together, and cleaning up the edges with fray check ( I tried the overlock method on my machine and it makes my panels curve... Aughhh). This is taking a very. Long. Time. But patience!! And then, I've sewn the two sets together to see what it would look like. So, the set of four to the left is the new set- good thing here is that they are lined up!!! To the right is the remaining of the disaster I had of the original set- you can notice the extreme puckering, the extreme misalignment (you can really see it when comparing the bottoms), and the slight curve to the right the panels take. Now my issue is this - I'm not sure if I maybe haven't seen enough panels, buttttttt I think my new method is still causing my panels to pucker. While it's not extreme as in the first set of panels, it's still there. Like I said before- I'm not sure if I haven't sewn enough panels together (maybe when all sewn together they'll 'stretch' themselves out while fitting on my body) but still, I'd rather fix this problem while I can now before I have to go about ripping more panels. Personally, I would fuse an interfacing to the back of the panels to smooth it out and prevent the stretching! I prefer the woven interfacing rather than that 'papery' kind.